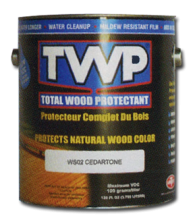 TWP® WS SERIES is a unique combination of chemicals that enhances the natural beauty and warmth of wood. The product is semitransparent and allows wood grain and color to show through. TWP® WS SERIES penetrates deeply into wood without surface film build, highlighting existing grain patterns with amazing clarity and warmth. 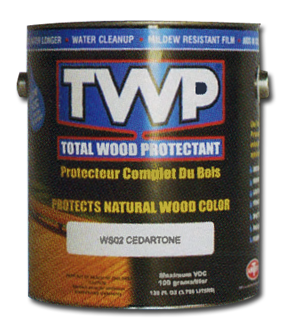 TWP® WS SERIES contains water repellents which inhibit the damage caused to wood by water absorption and contains carefully selected mildewcides that inhibit the growth of mildew on the surface of the stain. The TWP WS colors contain special UV absorbing pigments which inhibit unsightly graying caused by the sun. Refer to the Product Data Sheet (PDS) for preparation, cleaning and application instructions. This product is for above ground use only. TWP WS can be used for the same applications as our TWP 100 or TWP 1500 Stains. Click the button below to add the TWP WS Stain (WS Series) to your wish list.